This past weekend I was alerted to a friend of a friend of a friend who was looking for music for a video he wanted to post on Instagram. He was going to license music online and my friend, trying to help him, hooked him up with me. I’m guessing she thought that I might know something about this. Since I have been approached by friends in the past for music for different ads and what have you I do know a bit about it. Anyway, next thing I know I’m on the phone with–Wow cool– Santa Cruz Artist Icon Tim Ward. And we’re figuring on how to create him some music for a vid he wanted to post. It came out pretty well. 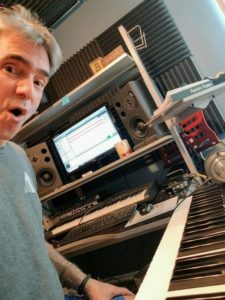 Here is the Instagram post that has the music I created in a few hours. Now how did we go from Music production for hire to this? First, we talked about what he wanted. And, I think the cool thing about this is it really can be anything. I mean, I’ve scored films and you can go anywhere from cocktail jazz to Nine Inch Nails to Halloween scary movie music in minutes. And, I mean this can be stuff I’ve never really heard before. Tim had been working on this already and had music in the vid that he liked, but didn’t own. He had actually used a reference that he like while he was creating the vid. And he gave me a few other links to Youtube videos that he liked the music for and I just went to work finding tools in my music creation programs. Next, I got to work creating. Once I had something – a sketch- I sent it to him. And back to the “canvas”, I went…and then back to Tim. We “back-and-forthed” a bunch of times to zero in on what he liked and wanted to fix in the mix and came up with the music in this vid. It didn’t take long at all. A few hours. And got him a video for his Instagram that has had a crap load of views already. You can totally tailor the music to what you want. Alexander’s Ragtime Band with the London Symphony and remixed by Skrillex. And it’s yours to do whatever you want with. Work With Music Production for Hire! You can reach out to me here for whatever you might want. Reviews: I’ve done various recordings and the like and have some great reviews on Yelp! Let me know what would make your world amazing!